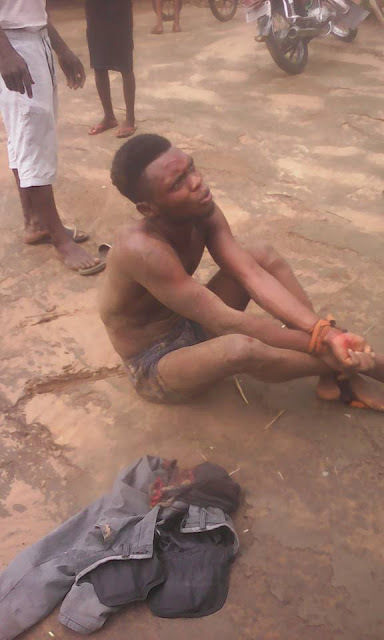 A so-called thief who has been looting property in the Ekpene Obo community of Akwa Ibom has been beaten mercilessly after being caught over the weekend. The man identified as Mr. Elijah Nehemiah on Sunday was publicly disgraced on Sunday afternoon after he entered a woman's house on Saturday night at 11 pm to steal her and locked himself in the room by mistake. and he could not escape. "It can only be God! 6 days for the thief and 1 day for God to reveal and vindicate." Here is Mr. Elijah Nehemiah on Sunday who has been looting my property in Ekpeneobo. As usual, he entered Saturday afternoon at 11 pm while confessing and hoping to make his chaos when my neighbor went to church but God willing, it was raining cat and dog, so he decided to fill my drum with water before go to Church. Look, he locked himself inside, but there was no room to escape. My God is at work. I'm going to recover everything. "